As the season comes to a close, Jawahir Roble has just made FA history. 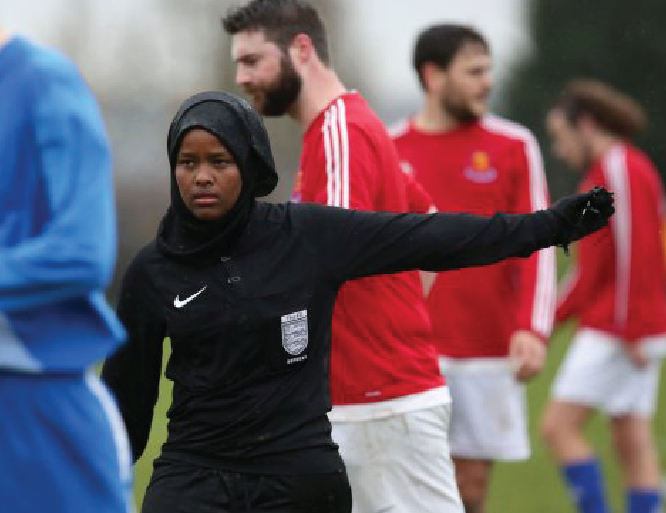 She’s become the first Muslim female referee in the UK. Dressed in a black coat and shorts over leggings, she also wears a hijab pitch-side. JJ, as she’s more commonly known, says that the first time she officiated a match, the players couldn’t believe that she was the ref. ‘When I first turned up to the match you could hear some boys just giggling, “No way she is the ref?! no!”,’ she recalls. ‘[But] they can see that I am the ref because I am wearing my full kit.’ Today, however, the players just ask her appropriate questions and she hasn’t had to face any kind of sexism on the pitch. ‘There was one time a guy came up to me and said, “I really like female referees, they’re good”. ‘I will take that, that’s very nice, but no one has ever said, “Get in the kitchen, you don’t belong here”. I’ve not heard that yet and I don’t want to hear it.’ Online, however, it’s a less positive story. She says she gets ‘stuff like, “‘You’re not even following the religion, you’re not following the culture”. I don’t know, some weird stuff. ‘Of course, football is not in my culture, no. But you know, I am here to break the stereotypes. Girls can play football, girls can do whatever they want. My religion is a part of me and I love it.’ To JJ, being Muslim simply means ‘being a good person, being modest and doing what makes you happy and I think I am doing all of that, but when people start mixing culture with religion, that’s when it gets confusing because some cultures are super, super strict, and people mistake it for religion’. She hopes to encourage more girls and ‘youth in general’ to take part in football. 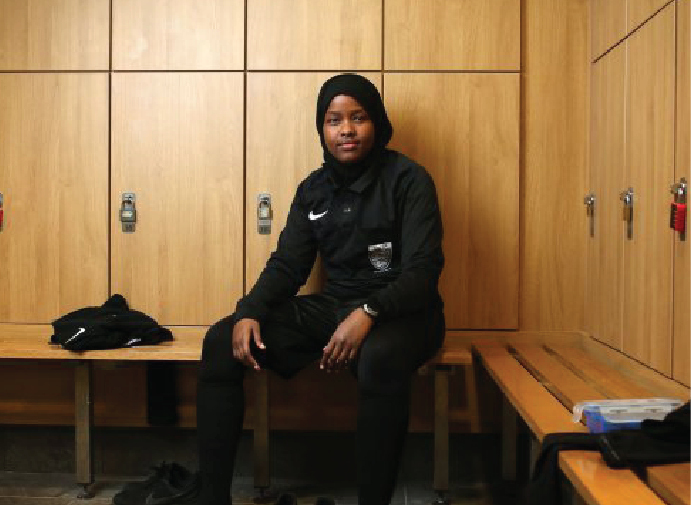 She grew up playing football as a kid in Mogadishu, Somalia, and decided to pursue refereeing more seriously after studying for coaching badges as a teenager in the UK. A local girl’s league was short of match officials and JJ volunteered. ‘I asked to volunteer for a girls league, called Capital Girls League, and they were short of referees and they said, “JJ would you like to help out”, and I was like, alright, and I haven’t looked back. ‘The support I received – all the positive feedback from parents and players – that kind of helped and pushed me towards the course.’ Her parents decided to move their family to the UK from the war-torn country, settling in North West London. She explains: ‘Literally no one was safe so the only choice was to leave, get on the next bus or coach, whatever and disappear. ‘I remember being at Heathrow airport, that was so sick, literally. Our family walked out of those automatic doors and literally the first thing we did was [go] to some chicken and chip shop. It was such a night, I will not forget.’ Football has provided her with a link between her two lives and JJ now referees for London and Middlesex country FAs, as well as for weekend amateur matches. Currently at level seven, JJ is aiming for a double promotion to level five. Her mentor, Alan Hill, believes that she has what it takes to get to level one. just a PR stunt ‘JJ is willing to learn. She has got the personality and she can communicate,’ he says. ‘She has that ambition. Now I can put her on the first steps of the ladder and it’s down to her commitment if she wants to do it. She is a good referee.’ So what’s next for JJ?